The preserved female European otter (Lutra lutra ) at the Grant Museum of Zoology. LDUCZ-Z2329. 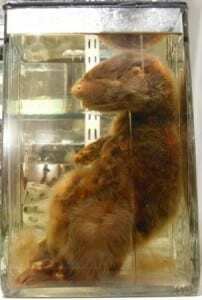 1) There are a number of species of otter, including the sea otter, the Asian shortclaw, and the giant river otter. The European otter is the most widespread, having found a place for itself in coastal and freshwater areas across Asia and Europe. 2) Individuals that live inland will hunt in low light, at dawn and dusk, earning them the cool title of crepuscular predators. Otters who live on the coast hunt during the day, meaning they are diurnal predators. The average common otter diet primarily comprises of fish, though water birds and amphibians such as frogs will also get hoovered up if the opportunity arises. Those individuals that live in saltwater habitats need to regularly gain access to freshwater in order to maintain their coat. 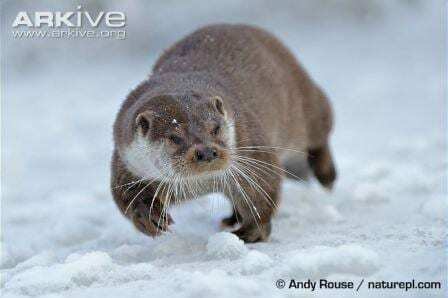 3) The European otter is a strongly independent animal that lives most of its life in solitude. Both males and females will dig a burrow, called a holt, along the bank of bodies of water such as rivers. The length of an otter’s holt seems to correspond with how plentiful the food supply in the area is, as well as the area available to hunt. That seems reasonable given you should never work on an empty stomach. A common otter can consume up to 15 percent of its body weight in fish each day. 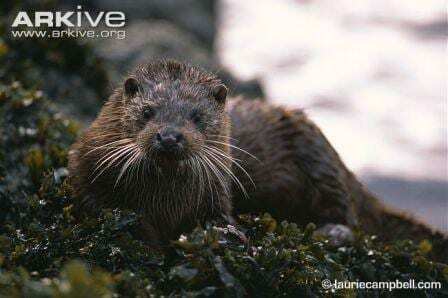 4) European otters have a number of adaptations especially for their aquatic lifestyle. Most obviously they have webbed feet, which enables them to swim with greater efficiency. When under water, the European otter can close both its nose, helping it not to gulp water down into its lungs, and its ears. The otter’s whiskers, or vibrissae if you want to impress your friends, are very sensitive and aid the otter in locating prey under water. 5) The European otter is currently classified as a ‘near-threatened’ species, making its alternative common name of ‘common otter’ unfortunate as it leads to the common mistake of people believing that they are common. With me? They are at risk due to a number of factors such as hunting, water pollution, water sports and loss of habitat. Pesticides have also played a part in the decline in otter number. European and Asian governmental bodies have passed legislation that works to limit the pesticides and help restore their habitats so that otters can increase their numbers.